How Can A Food Diary Help You Make Better Dietary Choices? How many times per week do you think you say that sentence to yourself? How many times per month do you let yourself have that little treat? How many calories are you eating each day? Over the course of a month, you could be piling on the pounds just because of that Mars Bar here and there or that KitKat that you sneakily stuff in your mouth between the vending machine and your desk. It might just be a little treat here and then but when it’s right there in front of you in black and white, on paper, you can soon see where the problem arises. You’ll be surprised at how unhealthily you eat when you actually see it all in front of you. It’s when you see the problem that you can start to make changes for a healthier lifestyle. Let’s say on an average day you have a large flat white coffee from your regular coffee shop with four or five sugars, dependent on your mood. It is a really big cup after all. You’re looking at what… 300-400 calories there with all the frothy milk, extra chocolate coating, sugars, etc. For lunch you’ll grab a chicken, bacon and mayonnaise sandwich from the local deli with a 100 calorie bag of crisps and a zero calorie drink. That’s healthy, right? Well, no. Not exactly. That sandwich has 499 calories in it. It is massive, has piles of mayo in there, and has fried bacon. What did you expect? Dinner tonight is probably going to be a large pizza because both you and your partner are working late. You both make your way through half that pizza each because it’s been such a hectic day, plus you have your fair share of those wedges, cheesy garlic bread, chocolate cake… You’re looking at 600-1000 calories right there dependent on pizza choices. You’ll have a couple of cups of tea throughout the day, and another big cup of coffee when you finish. No wonder you can never sleep. Just look at the calories you’ve consumed. Look at the fat content. What about that 250 calorie candy bar you forgot you had at lunch, and that occasional bacon sandwich you grab if you have an early start… The calories soon start to pile up and when you bear in mind you need to burn off 3,500 calories just to lose one pound in weight, you’re going to need to start counting. By keeping a food diary you can track the calories you are taking in. When you’ve written down everything you’ve eaten, you can’t ignore it. Its time to face the problem. All those coffees you keep buying are unnecessary calories, as are those alcoholic drinks you didn’t even want to have in the first place on Friday night. So are those Kit Kat’s that you have in the afternoon during your sugar-slump. When you see where the problem is, you can take active steps to change it, and with smart phone applications leading the way for calorie counting, there has never been a better excuse to start taking a closer look! It’s important to try to keep your weight in control as it has an effect on your overall mood, your propensity to exercise, your sleep quality and a host of other things that can worsen your winter blues symptoms. Beyond calories, however, it is also very important what kind of foods you eat. Some foods have the tendency to make you sluggish, sleepy or feeling down, while others can help you fight depression by boosting your mood. Of course, you can’t avoid the theory that your mood has a lot to answer for when it comes to your eating habits. We are all guilty of binge-eating chocolate ice cream when we are sad and going through a break-up for example, or enjoy one beer too many because we think getting drunk is better than facing our problems. This is why you should consider a mood-food diary. When you eat, you write down how you felt after you ate it. It’s the effects that occur in the two hours after you have eaten that you should focus on. How did the food make you feel – were you happy or sad? The foods you eat are not only affected by your mood, but your mood very much depends on the food that you eat too. For example, if you are feeling irritable, foods that are high in magnesium have been shown to help so boosting the chocolate, peppers, spinach, sunflower seeds and baked beans (amongst many others) that you eat is considered to be a good idea.… within reason. If you’re feeling stressed out or a tad depressed, you are going to want more vitamin B3 and good foods for this are turkey, chicken, pork, mushrooms, cabbage, peanuts and brown rice. If you can’t find your appetite at all, you should increase the zinc in your diet with ingredients like walnuts and almonds, sesame seeds, kiwi fruit and blackberries. Zinc has been shown to help with a lack of appetite because your body needs it in order to create HCI which in turn regulates the proteins that are used during digestion. Not only that bit zinc has the power to change the way thou taste foods, so when you are lacking in zinc, your food probably won’t taste that great to you. Of course, the only way you can be sure your diet is actually changing your diet (and you’re not just eating lots of healthy foods unnecessarily), the food-mood diary can help. Let’s say that you’re having a bit of a bad day and you’re feeling stressed, irritable, snappy and generally sluggish. Foods that have been shown to help with these three problems are plain yogurt (magnesium), almonds (stress and depression) and strawberries (magnesium again). You decide to let yourself have a sweet mid-afternoon snack so you throw some yogurt into a bowl and add some hazelnuts, almonds and chopped strawberries. After you’ve eaten it, take notice of the way your mood changes. Do you feel less sluggish; as though you’ve had an energy boost? Are you more focused on the job you are trying to finish? Is the day not quite so grey and miserable? Have you spotted that proverbial light at the end of the tunnel? It could be that the foods you have eaten to make you feel better have actually done their job and given you that much-needed boost to help see you through the rest of your busy day. When you jot these notes down in a mood-food diary, you’ll soon get a feel for what works and what doesn’t, and when you work out what works, you can eat those things more in a bid to feel better and eventually get through the bad-mood times. It just makes perfect sense when you think about it, doesn’t it? 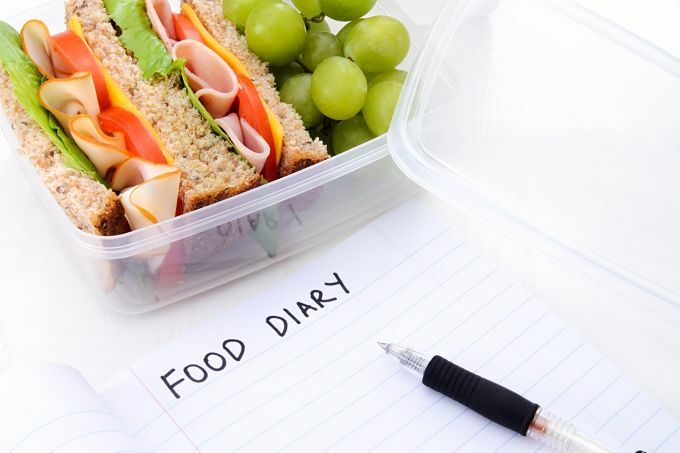 If you’re keeping a food diary anyway, what’s the harm in spending just a few more moments taking note of what mood-changes happened as a result of you eating those foods. If it means that you could lead a much happier, healthier life away from the sad and troublesome symptoms that often associate themselves with conditions such as stress, depression, anxiety and suchlike, wouldn’t it be worth working out how your body reacts to certain situations? Plus, when you’re writing down everything you are eating and the way that it makes you feel, you can soon learn triggers of certain symptoms. For example, you might learn that chocolate has a tendency to give you a headache. Once you spotted it written down a couple of times, you start to sense a pattern, and when you avoid chocolate, or find something to substitute it with, you’ll then find the headaches start to flare up less and less.